A suspect has been arrested on assault charges after viciously beating a man in Brooklyn on Sunday morning. Authorities say the attack took place around 7:30 a.m. in Borough Park near 46th Street and 13th Avenue. Farrukh Afzal, 37, of Staten Island was charged with assault, hate crime, criminal mischief and harassment. The NYPD reported the victim is a 62-year-old man who suffered cuts and bruises to his head during the beating. Surveillance cameras captured the shocking incident in which a man is seen getting out of his car and pursuing the victim, who may have been walking to services at a local synagogue at the time. 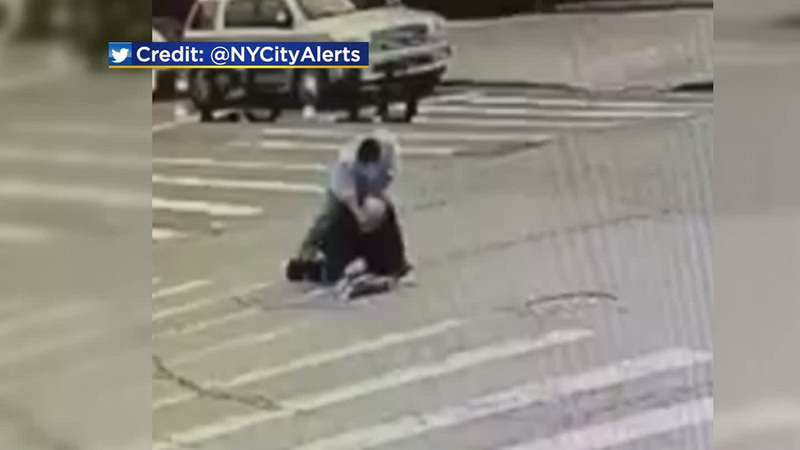 After chasing his victim into the middle of a nearby intersection, the attacker is seen repeatedly punching and shoving the older man to the ground. The brutal assault only ended when another bystander tries to intervene and is chased off by the suspect. Officials with Brooklyn’s Community Board 12 tweeted Sunday morning that they had spoken with the NYPD’s Hate Crimes Task Force and met with the victim at a local hospital. State Assemblyman Dov Hikind praised the NYPD for the quick arrest.